For more on mooncakes see: “China media calls for end to mooncake ‘bribery’” from the South China Morning Post by Wu Nan (8 Sept. 2013) and “What’s the big deal about Mooncakes?” from CNN Travel by Zoe Li (28 Sept. 2012). Awesome diagram. And what’s your favorite flavor of moon cake? I ate a run of the mill traditional, but sweet, one last year as part of a toddler playgroup party. It was fine. Better than most Christmas fruit cake. Perhaps this year I’ll indulge in the Haagen Daz version. How about you? I was in Taipei very briefly last week (yes, that’s quite brief), and had the chance to have an overly sweet one with a plum filling 棗泥. My dad likes the ones from his youth in Northern China – it’s not sweet but filled with onions or veggies, or something. The best ones are the ones with ice cream centers. So glad I’m writing this comment first thing in the morning when my stomach hasn’t woken up yet. Our household was moon cake free until yesterday. My husband was in Zhuhai for work and was gifted several boxes. If we’re lucky, he took them into the office today to ‘share the warmth of the season’ with his work colleagues. Love this multi-layered mooncake diagram!!! Happy mid autumn festival!! You too! I think we’ll head out to see the lanterns in one of the parks Friday evening. Any sign of Mid-Autumn Festival in your corner of Seattle? Nothing super festive to speak of, though the Halloween decorations are up (gasp! )… Though I have to say that mooncakes probably make a better “bribery delivery package” than an actual edible dessert. I’ve never been a fan!! Esp the huge ones w/the yolks! Bleh! My favorite are the egg yolk kind! Great graphic! Cheers and enjoy the holiday! 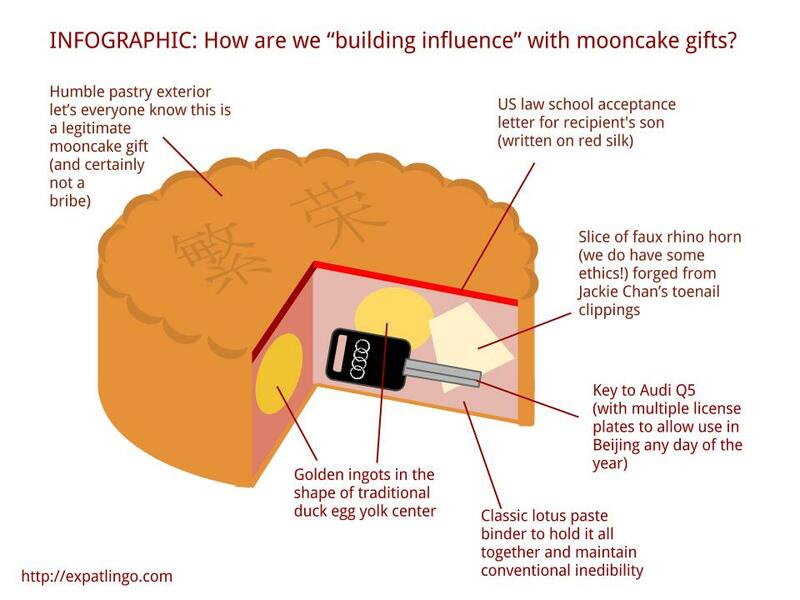 We are knee deep in moon cakes over here, but maybe I better dig them out and start sifting through them to see if someone wants to “build influence” with us! Perhaps there is a market for a mini-moonckae x-ray machine to scan contents for kickbacks and inducements? Happy Mid-Autumn Festival! 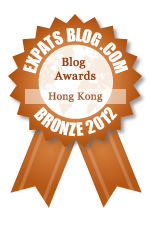 I once flew back to SFO from HKG with a box of Mooncake in my possession and had to be X-rayed going through Custom. The Custom guy told me they need to make sure there wasn’t any egg yolk hidden inside. Dried egg yolk is classified as farm product and strictly prohibited from outside of California. I was lucky there wasn’t or I would have to give it up and pay a hefty fine. So funny! And fussy: it is cooked after all, right? What could it possibly harm except your taste buds. Glad you were lucky. Ha! I assumed he meant bribery was an unhealthy tendency, but maybe the whole announcement had nothing at all to do with corruption, but was all about no consuming to much fat and sugar. Too funny. That is very true! A good point. I wasn’t thinking about red envelopes… I don’t think guanxi is going to go away any time soon! I liked it for the “conventional inedibility” bit. But, many err, yue ago, some Shenzhen convenience stores were selling progressive (edible) varieties. Taro was a memorable flavor. Theoretically something tasty and freshly baked in a pastry case should be delicious. Maybe its the long-life, shelf stable constraint that gives them a bad name. When will China’s McDonald’s come out with mooncake-shaped hot apple pies? maybe KFC could come out with infinite life shelf stable apple pies in mooncake shape? or maybe available in Park n Shop in China?